Dentalics | Perfect shade. Perfect smile. Using just your mobile phone, you can reduce the number of dental color mismatches. Launch Dentalics app on your mobile phone and take a photo of the patient's teeth. Just tap on the desired tooth and the app will start the shade detection process. 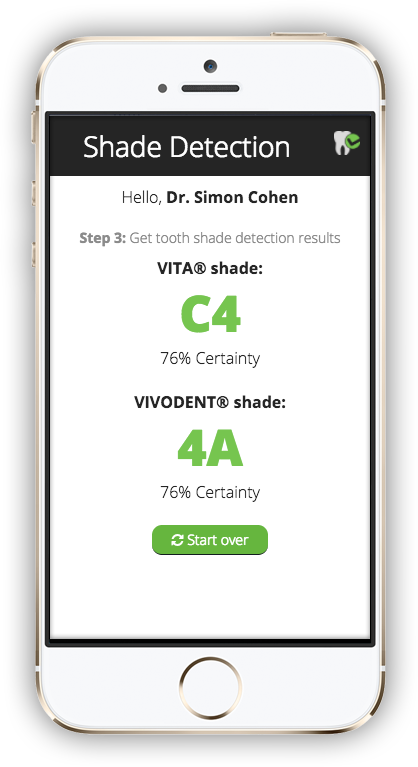 The app will show the result in Vita™ shade scale and Vivodent™ scale. Dental porcelain (also known as dental ceramic) is a porcelain dental material used by a dental technician to create biocompatible lifelike dental restorations, such as crowns, bridges, and veneers, for the patient. Evidence suggests they are effective (they are biocompatible, esthetic, insoluble and have hardness of 7 on the Mohs scale). For certain dental prostheses (such as three-unit molars porcelain fused to metal or in complete porcelain group) only zirconia-based restorations are recommended. The dentist will usually specify a shade or combination shades for different parts of the restoration, corresponding to a set of bottles in the lab containing the porcelain powder. A common shade system used is the Vita guide (Vita Classical and Vita 3D Master). There are two types of porcelain restorations: porcelain fused to metal and complete porcelain. For porcelain fused to metal, the black color of metal is first masked with an opaque layer to make it a shade of white and then consecutive layers are built up. The powder corresponding to the desired shade of dentine base is mixed with water, and then fired. Further layers are built up to mimic the natural translucency of the enamel of the tooth. The porcelain is fused to a semi-precious metal or precious metal such as gold, for extra strength. Many systems use an aluminium oxide or zirconium oxide or zirconia core instead of metal that makes complete porcelain restorations. Recent developments in CAD/CAM dentistry use special partially sintered ceramic (zirconia), glass-bonded ceramic ("Vitablock") or glass-ceramic ("ips.emax" lithium disilicate) formed into machinable blocks, which are fired again after machining. CAD/CAM restorations created with glass-ceramic CEREC technology appear to last well. 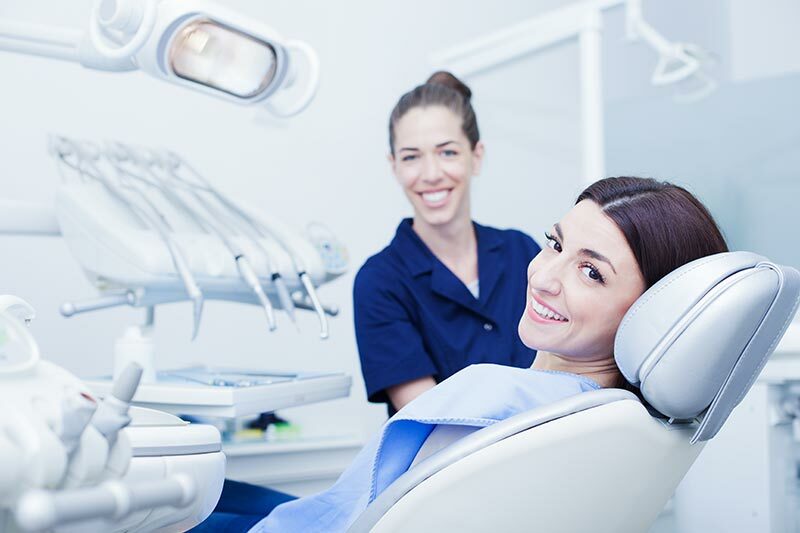 Utilizing in-office CAD/CAM technology, clinicians can design, fabricate and place all-ceramic inlays, onlays, crowns and veneers in a single patient visit. The ceramic restorations produced by this method have demonstrated excellent fit, strength and longevity. Dentalics provides dentists with a new and easy way to determine the shade of the implant or crown that will match the surrounding teeth of the patient. By using only the mobile phone's camera, the dentists takes a photo of the patient's teeth. The app will then use the best algorithms to detect the shade in the most accurate way. The result is displayed clearly with a Vita(TM) shade and can be sent to production right away. Shade Detection Send Shade Community Support Get It! Shade Detection Send Shade Full Support Get It!